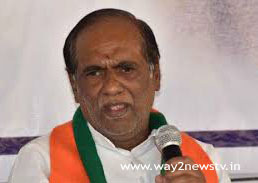 The BJP state president Laxman said the opposition parties violated the provisions of the Parliament.The BJP former Union Minister and BJP MP Bandaru Dattatreya, BJP state president Laxman, party legislator Kishan Reddy and BJP leaders sat on the one day fasting of BJP in Hyderabad Khairatabad. Laxman said that Congress has been provoking of hatred by the name of the caste.BJP leader Laxman said that Congress, which insulted Ambedkar, had no right to speak about Dalits. He said "In Parliament, stopped Prime Minister Modi, not allowed to speak him".the people are very happy with Modi Government, The parties rejected by the people have tried to block it.they are Provoking Regional, caste, and religious hatred.The TRS, which blocked Parliament on the reservation, alleged that was not reserved for private university bill.MP Bandaru Dattatreya said, "Blocking Parliament means doing against democracy.Didn't happen development the last few years, the BJP has taken over the development in four years.Dattatreya said that the hunger strike was conducting as a peaceful strike to protect democracy.